Not that I think you stalk me or anything, but if you have been wondering where I've been lately you should know I've been sulking over the closure of Picnik. Also over Facebook's new Timeline feature. Maybe sulking isn't the right word. Maybe a better word is incapacitated. If you are imagining me hiding in a closet eating chocolate chip cookies and trembling over all the unnecessary change that's going on right now then you have a pretty accurate picture of how I've spent the last 2 months. I did warn you I don't deal well with change. Also I thought my kids and yard were needing some attention. Regardless of what I was actually doing, I'm back and I have lots of delicious recipes to share with you. Just in time for summer! You know these cookies will help you fit into your swimsuit, right? Beat butter until softened. Add sugars and beat until smooth. Add eggs, one at a time. Mix in vanilla. Add the rest of the dry ingredients all at once into bowl with butter mixture. Mix just until dry ingredients are incorporated. Gently stir in most of the coconut M&Ms (reserve some to put on top!) and the semisweet chips. Place back on pan and bake at 375 for about 8 minutes or just until cookies are set. Note: You *can* omit the flaked coconut on top of the cookies but I highly recommend adding it. I tried these both ways and they just aren't the same without the coconut on top. It gets all toasty in the oven and adds a great crunch and nuttiness to the cookie. 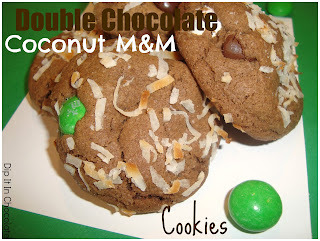 If you don't like coconut what are you doing making coconut M&M cookies anyways!? Yum! I love those coconut m&ms! Lifting to your mouth definitely counts. So does mixing the M&Ms in by HAND. Gosh... who even does that anymore.